My Taiwanese friend bought lots of walnuts last week. We never use walnuts as a dessert in the past. As far as I know, walnuts does not have too much taste to it and a fair amount of sugar is usually added to compensate for its taste. That's my opinion, I might be wrong. However, it does have lots of nutritious value. 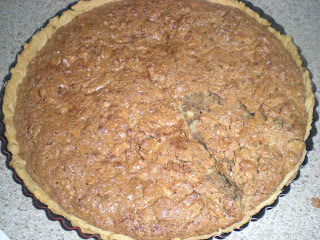 The walnut pie recipe is adapted from American Food. 2. In mixing bowl, beat eggs until foamy. Pour in melted butter and stir until combined. Mix in brown and white sugar, milk, flour, salt, and vanilla. Add in walnuts. 3. Prepare pie dough and roll up onto a 9'' plate. Pour in the filling. 4. Bake for 10 mins then reduce heat to 350F. Bake for another 35 to 40 mins until crust is browned and filling is set. Walnuts can add a subtle flavor to desserts when paired with a complementary flavor. It is nice that you tried something new though. I've never made walnut-based dessert, but I did like the ones I've tasted: they were indeed quite sweet, but the flavours blended nicely. The pie looks nice and crumbly. 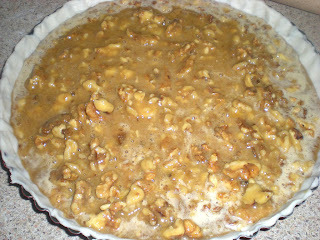 The pie looks grand - great way to use walnuts. I've made walnut cake but never walnut pie...so far. OMG, that looks like some delicious condensed matter! Ha! I love walnut in desserts like walnut ice cream, but I've never seen a walnut pie. Love it when I come across something new! 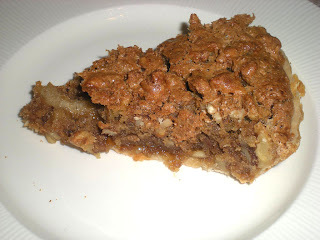 Nice use of walnuts - very similar to a pecan pie. I come from a region that grows a lot of walnuts and I really like the flavor of them. They are high in tannins just like wine and tea and perhaps that is why you don't like them too much? They are very good for you too!